Good news for those of you with more "cozy" living conditions. When the original Kinect launched for the Xbox 360, it had a minimum distance requirement of six to eight feet. This was all well and good if you happened to be one of the nuclear families living in a middle-class suburban home that seemed to feature in every advertisement for the device, but for those of us with more "realistic" living arrangements, it quickly became an obstacle. Keen-eyed fans scouring a leaked Xbox One instruction manual discovered that the minimum distance for the new Kinect 2.0 has shrunk to 1.4 meters (around 4.6 feet). The leaked document is the Brazilian version of the console's manual (hence the sensible, metric measurements). The manual details what players will have to do to get their Xbox One up and running, including connecting to the internet (which is step four in the manual), and not standing it upright. It also recommends that players have a 720p or higher quality television. Dropping the minimum distance for Kinect is definitely a step in the right direction. Microsoft is really pushing the fact that Kinect 2.0 is an integral part of the Xbox One experience, and if people's living arrangements prevented them from using the device, it may have made them think twice about buying the console. Do you live in a small apartment? 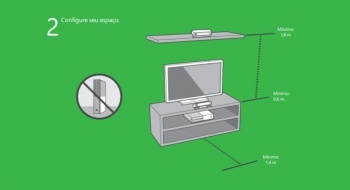 Have you had any troubles with consoles that require a lot of room, such as the original Kinect or the original Wii?